Feathers, florals, shimmer and more! 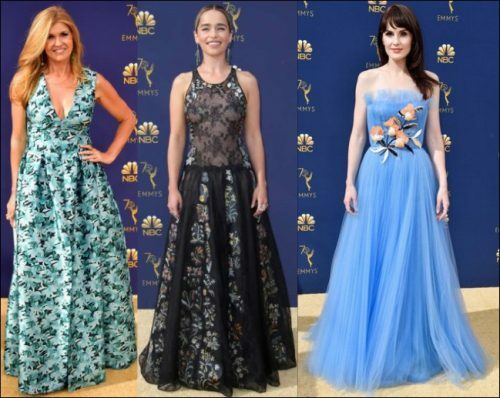 See all the red carpet dresses and trends from the 2018 Emmy Awards here! Tatiana Maslany skipped the dress and opted for a Christian Siriano jumpsuit and Christian Louboutin shoes. 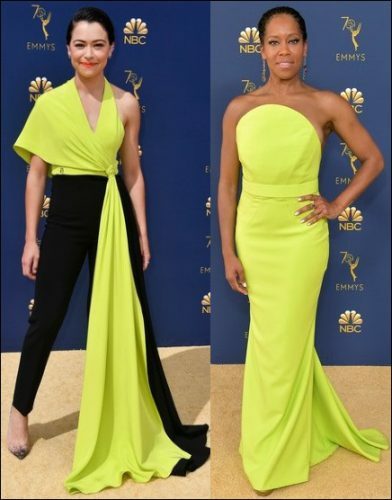 Regina King took home the Emmy in a Christian Siriano dress and Irene Neuwirth dangling earrings. Sarah Paulson wore a plunging sweetheart gown with feathers adorning the bottom of her Oscar de la Renta dress. Penelope Cruz wore a customized feathered faint blue Chanel gown. Connie Britton wore a plunging Sachin & Babi floral print dress. Emilia Clarke was all smiles in a sleeveless Christian Dior lace and floral embroidered gown. Michelle Dockery brightened up the red carpet in a strapless Carolina Herrera gown. Tracee Ellis Ross wore a Valentino Haute Coutture gown. 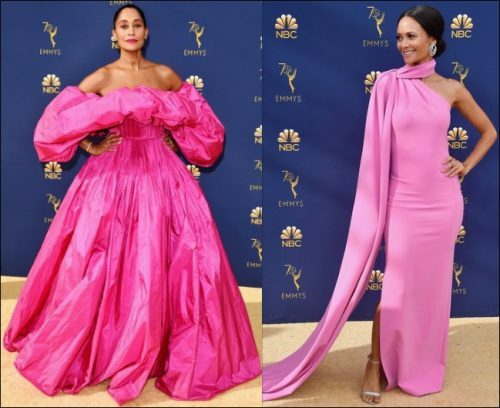 Thandie Newton took home the Emmy in a hot pink Brandon Maxwell gown. Sandra Oh, who made history by being the first Asian American to be nominated for Lead Actress in a Drama Series, wore a plunging cap-sleeved Ralph & Russo dress. Rachel Brosnahan looked beautiful winning her first Emmy in an Oscar de la Renta gown. Mandy Moore wore a customized plunging Rodarte dress. 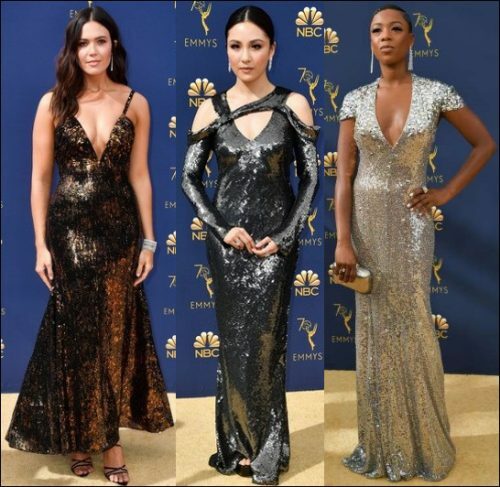 Constance Wu looked slick in a cut-out Jason Wu gown. Samira Wiley shimmered in a cap-sleeved Jenny Peckham dress. Adina Porter wore a customized silk Rubin and Chapelle dress. 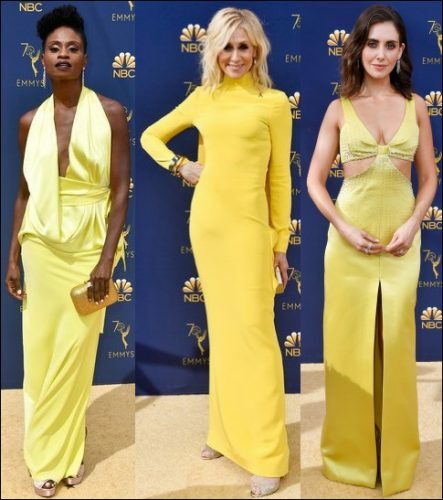 Nominee Judith Light covered up in a long-sleeved yellow dress. Alison Brie played peek-a-boo in a cut-out Miu Miu dress. Nominee Jessica Biel looked beautiful in a strapless Ralph & Russo gown. Scarlett Johansson showed off some leg in an off-the-shoulder Balmain slit dress. 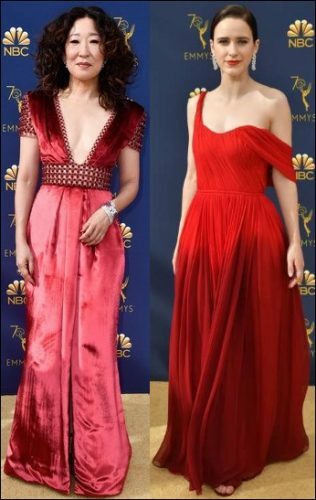 Claire Foy took home an Emmy in a strapless Calvin Klein by Appointment dress with a large bow in the back. Kristen Bell showed off her figure in a body-hugging Solace London gown.